Heat a large skillet or sauté pan over medium heat. Add the bacon and cook until crisp, about 5 minutes. Remove the bacon with a slotted spatula, drain on a paper towel, and reserve the rendered fat. Add the potatoes to the pan with the bacon fat, toss to coat, and season with salt and pepper. Transfer the potatoes to a nonstick baking sheet and bake until tender, about 30 minutes. Meanwhile, combine the juice, sugar, kumquat skins, and vinegar in a medium nonreactive saucepan. Bring the mixture to a boil, then reduce the heat to medium and let it simmer until the skins are tender, about 10 minutes. Remove the skins with a slotted spoon and set aside. Add the chestnuts to the liquid and bring them to a boil. Reduce the heat to medium and cook until the liquid has reduced by three fourths into a thick syrup, about 1 hour. The nuts should be tender enough to break into bits with the nudge of a wooden spoon. Season with salt and pepper. 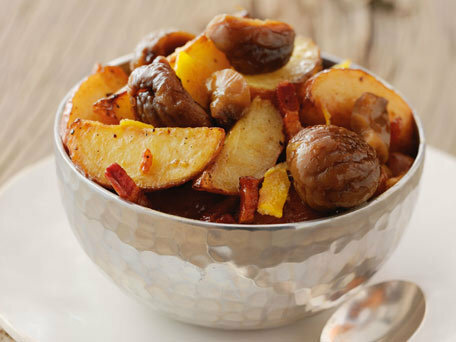 Toss the roasted potatoes with the reserved bacon and kumquat peels. Place them on a platter and top with the chestnut confit to serve.